Delta, United, Southwest, American, Spirit, and Frontier are among the airlines making storm preparations. 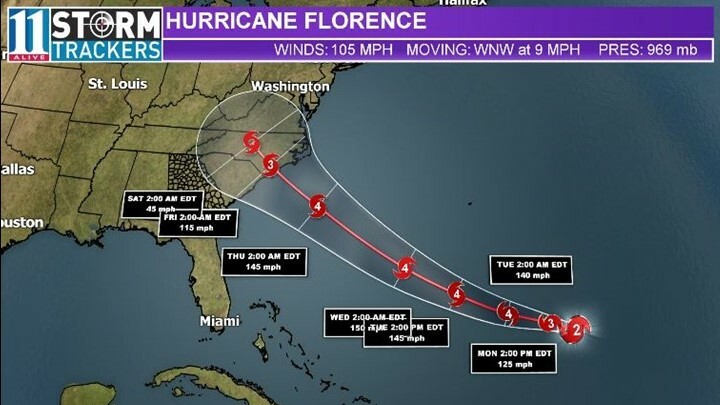 ATLANTA - The major airlines out of Hartsfield-Jackson International Airport are bracing for Florence’s impact on the east coast. Atlanta-based Delta has expanded its travel waiver to now include Savannah, Georgia. This is in addition to multiple airports in Virginia and the Carolinas. United, Southwest, American, Spirit, and Frontier are among the other airlines making storm preparations. Some airlines will allow you to change your flights for free while waiving fees for baggage and pets or even offering refunds. But, if you have a flight planned for one of these areas it's important to check with your carrier for their specific policies because the offerings and dates will vary. Delta says it will likely make decisions about cancellations or other changes about 24 hours before Florence makes landfall. However, some airlines have already canceled certain flights out of Atlanta beginning on Thursday.